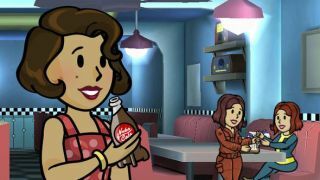 Fallout Shelter's out looking for love, as snaps advertising the game on Tinder have surfaced. When you click on the Fallout Shelter photo, it automatically redirects to a Tinder subsite, with redirects you to Fallout Shelter on Google Play or iTunes. Using the dating app to stealth-advertise products is not uncommon, having been done by the makers of indie hit Ex-Machina who created a Tinder profile using an image of the main character Ava to lure unsuspecting men into a dialogue - part creepy, part zeitgeist genius. It is also quite an appropriate medium for Bethesda. You add to your vault numbers by making the characters procreate - although with few vault co-inhabitants to choose from, you'd imagine people get a bit antsy in the dating stakes. Bethesda has publicised it on Twitter too, even contributing a hashtag #DateADweller to encourage lots of lovely user-generated content including tweets and screenshots showing the characters they'd date in the game. While verifying the story, we did come across a Fallout Shelter account on Tinder, but our reflex auto-left-swiping thumb happened before we could stop it to grab a screenshot. Sorry Vault Boy! We also apologise to anyone else we inadvertently left-swiped in haste to verify this story.